F or as long as I can remember, I was always singing. As a child, I sang endlessly with my mother's phonograph records, ranging anywhere from Mario Lanza to Nat King Cole and the classic musicals like Carousel and Oklahoma. My grandmother was really the one to encourage me to find my musical talents. In Elementary school I wanted desperately to play a musical instrument. I really wanted to play the piano most of all. But I didn't get a piano until my senior year of high school. The first instrument the music instructor gave me was a flute, which was a failure. Next came the trumpet that quickly left in two weeks' time. Then came the chorus. A large blow loomed yet ahead. After I sang for the chorus teacher, my mother informed me that the teacher told her I had no vocal talents. She couldn't place my voice. However, this didn't stop me from trying to convince the other teachers that I had talent! I was already a Lyric Tenor at the age of eleven with adult vocal chords, and a full voice high C.
I spent the summer before junior high school in the country with friends of the family, where I took long walks, singing to the squirrels and any of God's creatures that would listen to me. In junior high, I enrolled in chorus. Upon hearing my voice, the chorus teacher, Lois Lee, took me aside and said I had the makings of a fine operatic tenor. It was the biggest surprise! For the next two years, this wonderful woman worked with me on her own time, after school, vocalizing my range and teaching me German Lieder and Broadway show tunes. At this point she introduced me to Aldersgate Methodist Church, where she was a member. I immediately became a member of the choir. At church, I learned the invaluable tools of sight-singing and the great Oratorio répértoire. 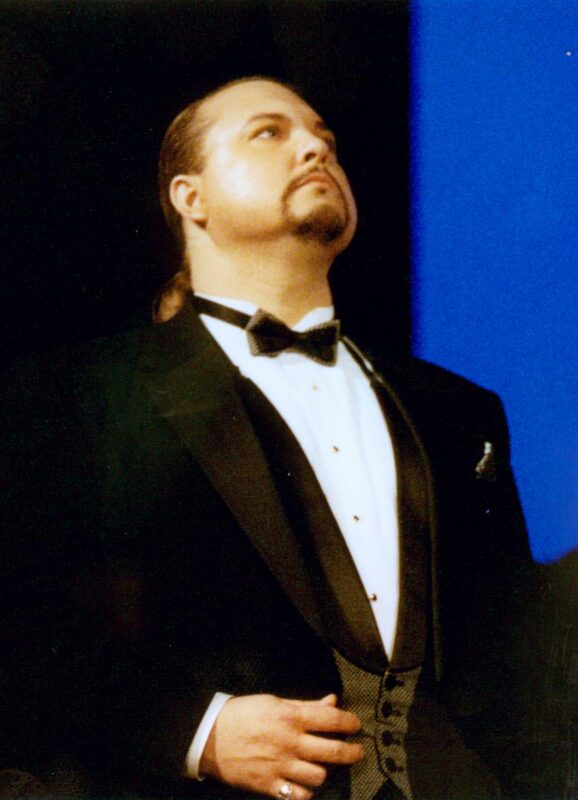 The director, Wayne Zarr, a classical operatic tenor himself, gave me free voice lessons. I was learning all of the great operatic arias for tenor, whether I was ready for them or not! I was fortunate enough to go to El Camino High School in South San Francisco. They had an exceptional performing arts department. Running this magical theater department was a married team, Ted and Elizabeth Marr. Both teachers were veteran professionals in the arts before becoming high school teachers. They had vast knowledge about the do's and don'ts of the theater. Now my training was really beginning. I quickly became soloist in their traveling show troupe which gave me hundreds of opportunities to grow and develop my performance skills all over the country. While still in high school I studied Italian with Elena Arana at the Italian Cultural Center. Desperate to sing opera, I needed an advanced voice teacher. William McKenna, a protégé of the great Italian tenor Giovanni Martinelli, became my Maestro. Under Bill's guidance, I learned much about the glorious music of the great operetta composers: Lehar, Romberg, Herbert, Friml, and Kalman. Along with keeping my grades up and studying music, I found time to audition and perform in musicals and many concerts. Eager to graduate and go on to college, I took a few night courses at Skyline Jr. College where I sang my first opera, "Dialogues of the Carmelites" by Poulenc, under the direction of William Conrad. I attended Skyline Jr. College for two years, studying piano, musical composition, and voice. Also, I studied music history and dramatic arts at California State University at San Francisco. Maestro Lazlo Varga chose me to sing the Tenor lead in Puccini's Gianni Schicchi. In 1981, I won the Metropolitan Opera auditions, Apprentice Category, the youngest person to have done so. I attended master classes with the famed Metropolitan Opera Mezzo-Soprano, Blanche Thebom; and Metropolitan Opera coach, Jack Metz. I studied voice and coached privately with Janet Parlova, Robert R. Conrad, Steve Olla, Inara Morgenstern, Edwin Barlow, Maria Greco, and several others. Finding a voice teacher in the mid-1980's was the hardest thing I have ever had to do. Many teachers I worked with had good intentions but no real knowledge of vocal technique. I soon found out that no knowledge of vocal technique was just as bad as incorrect knowledge. I soon got into vocal trouble and lost my voice. I was devastated and thought I would never sing again but that was not my destiny. After seeing a voice doctor and being completely mute for three months, a friend referred me to a voice teacher, John De Merchant. He would change my life forever. John was a student of Dr. Douglas Stanley, who taught the Melocchi method of the lowered larynx. I had the privilege of working with this man off and on for ten years. Not only did I acquire a phenomenal vocal technique with power, brilliance and exceptional range of three and a half octaves, but I also learned how to be a Divo under his guidance: I learned style, and elegance. He also introduced me to Bel Canto and dramatic répértoire. Under John De Merchant's tutelage, I was able to perform with many opera and musical theater companies in the Bay Area for many years. The most important thing I learned from working with Mr. De Merchant, however, was that I also wanted to become a great teacher. I love performing, but my true calling is to guide young singers in the art of singing. I started teaching under John's direction in 1985, and I have been teaching ever since. There comes a time when every accomplished singer must become his/her own master teacher. After John retired, I coached exclusively with renowned pianist and vocal coach, Russell Norman, from the San Francisco Conservatory of Music. In the mid-1990's, I took a position at the venerable Melody Lane sheet music store in Palo Alto and became store manager. While I was at Melody Lane, I met many performing artists and teachers. I continued to teach voice students and perform with such companies as TheaterWorks, Marin Civic Light Opera, Berkeley Opera, Cinnabar Opera, Pocket Opera, and the Marin Symphony. I wanted to help my students and other performers as well as further my development as a concert artist. I then decided to find a performance venue and create an ongoing concert series. My Studio Galas provide performance opportunities for my advanced students as well as professional artists in concert for appreciative Bay Area audiences. When Melody Lane closed in 2000, I decided to devote myself to teaching and nurturing gifted students. In 2004, I moved to San Jose and opened my vocal studio. I help meet the demand for competent voice teachers in the South Bay area. 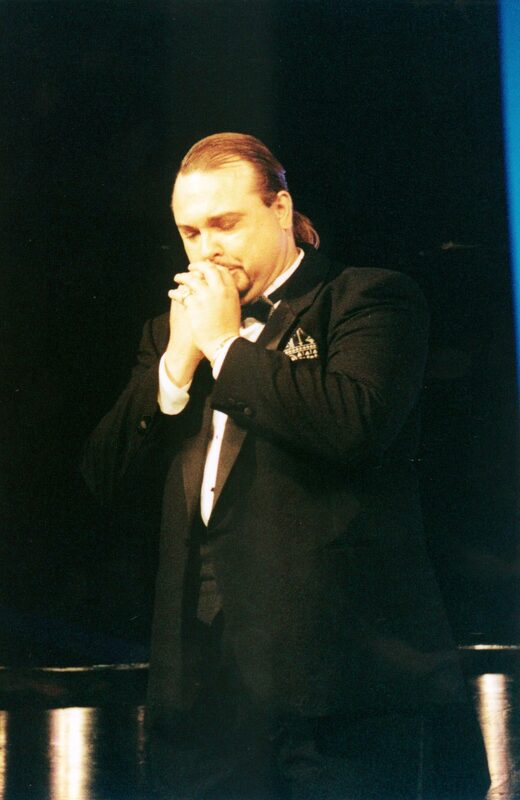 I continue to grow artistically and improve my own performance skills as an operatic dramatic tenor.